Description: Make gourmet chocolate chip cookies in your own kitchen in minutes! 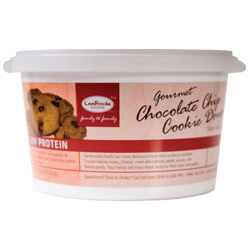 Each 3 lb tub with a reclosable lid yields approximately four dozen cookies. For all you gourmet cookie lovers, there's nothing better than a warm, freshly baked, chocolate chip cookie right from the oven. One taste will prove that Cambrooke's crafting is right. No one can resist the convenience of this delicious scoop-and-bake gourmet cookie dough. They bake perfect cookies every time! Preparation: Preheat oven to 350° F. Drop dough by spoonfulls two inches apart onto ungreased or parchment-lined baking sheets. Bake for approximately 7 minutes or until golden brown. Let cool slightly on baking sheet before transferring to a wire rack. For crispier cookies, allow to bake slightly longer. Serving Suggestions: Make Chocolate Chip Cookie Bars. Press desired amount of cookie dough into an ungreased 8-inch square pan and bake 25-30 minutes, or until golden. Let cool before cutting into bars. Storage: You can safely store the dough six months in the freezer or six weeks in the refrigerator (once opened or unopen). Ingredients: Wheat starch, sugar, margarine (partially hydrogenated vegetable oil [soy and/or cottonseed] water, salt mono and diglycerides, soy lecithin, sodium benzoate, artificial flavor, beta carotene for color, and vitamin A palmitate), chocolate chips (sugar, chocolate liquor, cocoa butter, soy lecithin, vanilla), water, butter (cream, natural flavorings), modified food starch, salt, natural flavor, molasses, baking soda. Contains milk, soy and wheat. From Anonymous of Red Deer, Alberta on 11/3/2005 . Orders from this store will be shipped to Canada. For orders to be shipped to the US, please use our US store. For destinations other than Canada or the US, please call to order. Si vous parlez seulement français et que vous désirez commander des produits "Cambrooke" ou pour avoir plus d´informations, veuillez contacter Spécialités Paramed au 1 844 395 2458.